A lightweight seamless washable glove with a latex coated palm. Incredible lightweight touch and flexibility with all the protection and grip of a SHOWA glove, a real unique all-purpose glove. A textured latex coated palm on a fine lightweight nylon liner gives the user a more flexible wear. The nylon allows for maximum ventilation and comfort with an extended wrist fit. 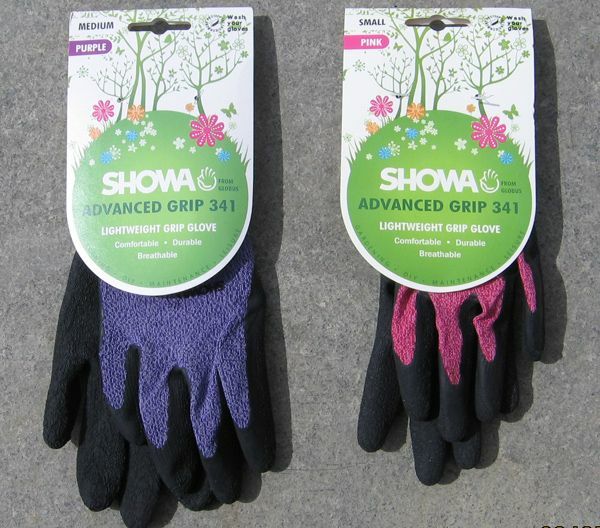 The ADVANCED GRIP 341 keeps hands, fingers and finger nails clean and protects against micro-cuts whilst providing a secure grip in wet and moist conditions. Suitable for all general maintenance gardening such as weeding, raking, mowing, pot work and also shrub and tree pruning or surgery. Will provide some limited protection against thorns. Also great for DIY, working with animals etc. Large and medium come in purple, small in pink (both colours as per image).